“The King of Kings” – Silent film, live music! “The King of Kings” – Cecil B. DeMille’s classic silent film depicts the life and passion of Jesus. See silent film the way it was meant to be: with live musical accompaniment! 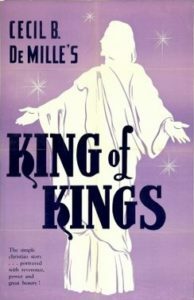 Cecil B. DeMille’s 1928 classic “The King of Kings” will be matched with a live performance by premiere theater organist Walt Strony. Selections for the movie score include Handel’s “Hallelujah Chorus” and works by Wagner. Strony has personally chosen music to highlight the emotions evoked by the actors. The modern audience will feel a powerful impact. Admission is free! A free reception follows. This is a production of Arts @ PEACE, our program of free, high-quality cultural events for the whole community! Any donations received will be accepted gratefully to benefit the PEACE Organ Fund. We are raising money to buy a new, combination digital-pipe organ for our Sanctuary! Just in time to start our observance of Lent! This silent film classic depicts the ministry, passion, resurrection and ascension of Jesus. It was the first time the face of Jesus ever appeared in film, and DeMille worked hard to portray the story in a way that was both respectful and powerful. “Seeing a silent film live with an audience is totally different from seeing a silent film on a TV set,” Strony says. The combination of live music with DeMille’s sensitive direction still stirs people. It certainly moves Strony, who plays at silent film festivals across America. He enjoys the challenge of assembling a score that “grabs hold of a character musically” and highlights the emotions the actors are portraying, he said. We’ll be showing the 1928 recut version, which is 42 minutes shorter than the 1927 original. It’s a tighter and better presentation, Strony says. More about “The King of Kings” and plans for a new organ are here, or call 530-268-2692. More events at PEACE Lutheran Church.